Here is the recipe for this delicious sandwich. Melt 1 tbsp of butter in a skillet over medium heat. Add the sliced red onion and stir occasionally until color changes to slightly brown and the taste is sweet about 10-15 minutes. Remove onions from skillet and set aside. Spread 1 Tbsp of the remaining butter onto one side of each slice of bread.Divide BBQ sauce evenly among 4 of the slices, and spread evenly opposite the butter side. Lay cheddar cheese on top of sauce. Divide caramelized onion among the sandwiches, then top with pepper jack. Finish assembly by placing remaining bread slices on top. The butter sides of the bread should both be on the outside of the sandwiches. Melt the remaining butter in the skillet on medium-low. Cook sandwiches two at a time, flipping when the bread is golden brown on one side and cheese begins to melt. If cheese is not melting quickly enough, place a lid over the pan or use a heavy skillet to place on top and press the sandwiches down. I just had a Gouda grilled cheese for lunch a few days ago. 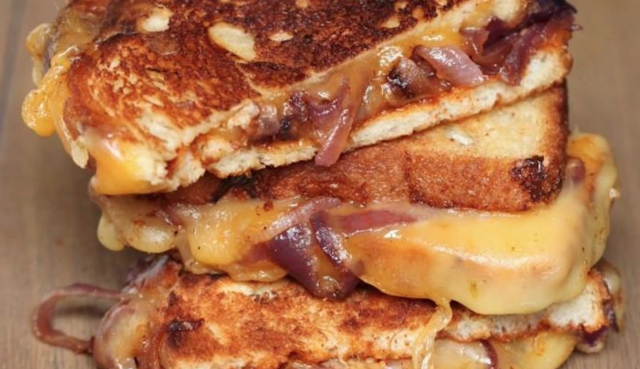 This will definitely be my next Grilled Cheese 'sammich'. Thanks for sharing!